With hundreds of courses to date, Esthetic World Beauty has truly reinvented the way people learn Microblading. Our comprehensive training program teaches the theoretical and practical application of Microblading to people with all levels of experience. The success of our students is our number one priority. See for yourself the wonderful opportunities that come along with becoming Microblading professional. Microblading has never been more sought after than at this point in time. The average microblading technician charges $400 Per Treatment. If YOU were to see ONE client PER DAY, 5 days a week, you could earn $15,000+ Per month. Thats not a typo. 1-2 hours a day, 5 days a week. We’ve Got Your Education Covered – What Will You Do With It? This training teaches the basic fundamentals of microblading. It includes basic shapes and patterns suitable for those with or without permanent makeup experience. Microblading is a form of cosmetic tattoo. Through the manual process of inserting pigment into the upper layers of the skin (upper layer of dermis), we create the desired fullness and shape of the eyebrows with the most realistic end-product in mind. 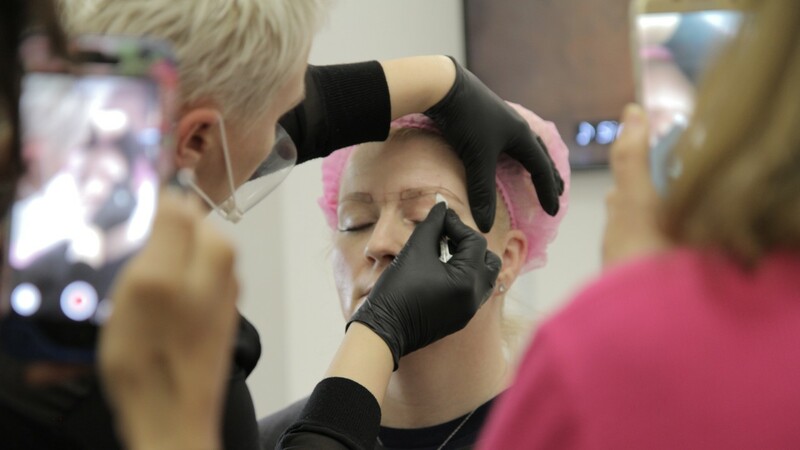 Our three-day intensive training program is designed for students to develop the necessary skills to be proficient in microblading, regardless of their current experience level. Our 5-day intensive combination course offers new students and former students an ideal combination of the manual microblading technique along with the machine method of shading. We have chosen to offer a combination course for a variety of reasons. The shading technique complements the look of microblading. It offers a powdered look that fills in the brow. 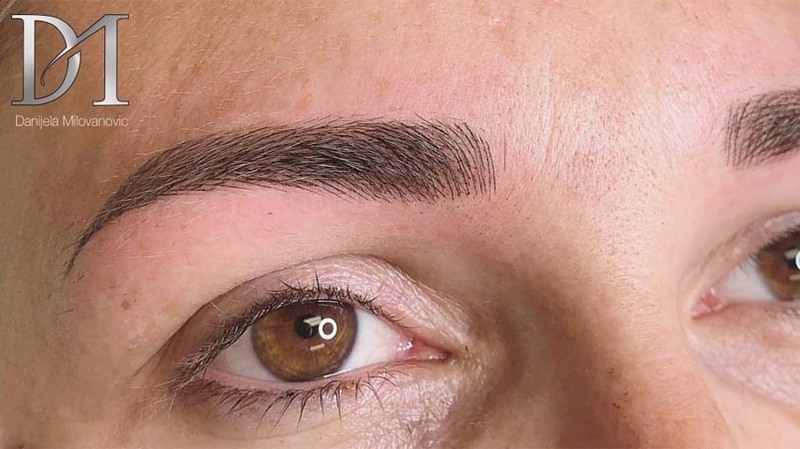 As the permanent make-up industry grows, our clients and students have expressed an interest in catering to the ultra-realistic look of microblading as well as the more dramatic, filled in, look of shading. The Esthetic World Beauty Shading Training Course is designed for students who have either completed the fundamental microblading training course at EWB or students that are currently certified in the fundamentals of microblading. This intensive Two-Day Shading Training is ideal for those who would like to include the Machine or Manual Shading technique in their permanent makeup service. Students should be prepared to work on both synthetic skins and live models while solving issues in unique client scenarios. Through this course, students will be able to more specifically cater to their clients’ needs and gain the knowledge and hands-on practice to set their work apart from entry level microblading technicians. After successfully learning and demonstrating the microblading technique on two different synthetic skins, students then perform on a live model under the supervision of the instructor. 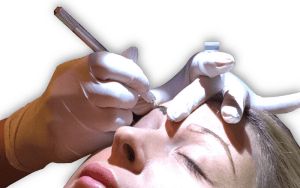 Our students have the lifetime support of Esthetic World Beauty in the form of our Facebook group (Microblading Training – Esthetic World Beauty) and direct contact with us via e-mail, text massage, and phone. What I love most is how eager the staff is to answer any of my questions. They are so patient and it really meant a lot to me. The curriculum was full of detail but taught in a way I could understand, even having no experience in the field. I am feeling confident having completed the course. The educators here really have a passion for what they do. It gave me energy just seeing how excited they are about teaching what they love. Nowadays, there are tons of eyebrow products and eyebrow design services available on the market. Even though most of them are good at keeping your brows neat and groomed, the problem is that their effect does not last long. And that’s when microblading comes into play. Microblading is a new beauty trend that has already won the hearts of thousands of women worldwide. Unlike other eyebrow procedures that come and go, microblading might be here to stay. EWB comprehensive training program teaches both theoretical and practical application of microblading. Most microblading courses we provide include a detailed examination of brow morphology as well as the comprehensive background in color theory. You will get to know our unique method of achieving the ideal brow shape. What’s more, you will have an opportunity to practice microblading on a live model. And that’s just the beginning. 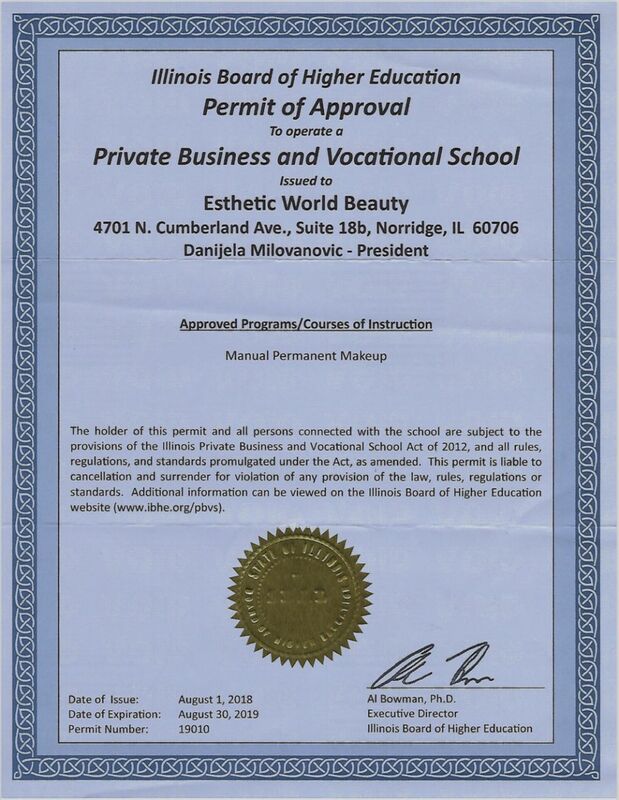 Eshtetic World Beauty Inc. is not accredited by a US Department of Education recognized accrediting body. Click here to open certificate.